Paraphrasing the early American statesman and philosopher Benjamin Franklin (“If you would be loved, love and be lovable.” Poor Richard’s Almanack), this fortune reminds us that — when it comes to love — we reap what we sow. 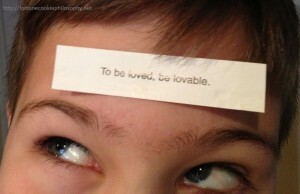 If you are hungry for love, this fortune seems to say, you should sow in yourself the qualities that will attract the love of others. If you are simply hungry, you might instead sow seeds of lovage, so that you may enjoy tasty salads and soups come spring. This entry was posted in Fortunes and tagged American, Benjamin Franklin, Love on January 12, 2013 by FCPhilosophy.